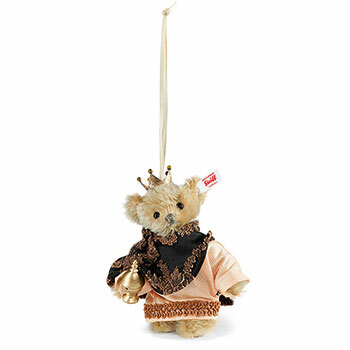 Steiff Casper Teddy Bear Ornament Discounts Apply ! Made from The Finest High Quality Beige Mohair. Last winter we launched the series "Three Wise Men" - the Holy Kings from the East whose long journey emphasizes the importance of the birth of Christ for the world. After Melchior, this year it is Caspar´s turn to set off on his journey in a richly decorated fashion. Made as an ornament, like his predecessor, he wears a softly shimmering robe with an elaborate border, a patterned shawl collar and a metal crown on top. The gift he bears is a wood-turned, gold-painted censer - intended for frankincense, symbol of deity. 5 way jointed with Safety Eyes and stuffed with Safety Filling, and with gold-plated "Button in Ear" and Surface Washable 2nd in a series of ornaments. This Bear is part of Steiff's 2015 Exclusive range.